In a food processor, cream the butter and then add the sugars until thoroughly combined. Sweet Corn Mix, the almond flour and salt and blend until all the ingredients are combined. Add the oats and the slivered almonds and briefly mix on low. Pour the mixture evenly into a pan set to medium heat and stir constantly until golden. Spread the granola on a tray and refrigerate to cool. 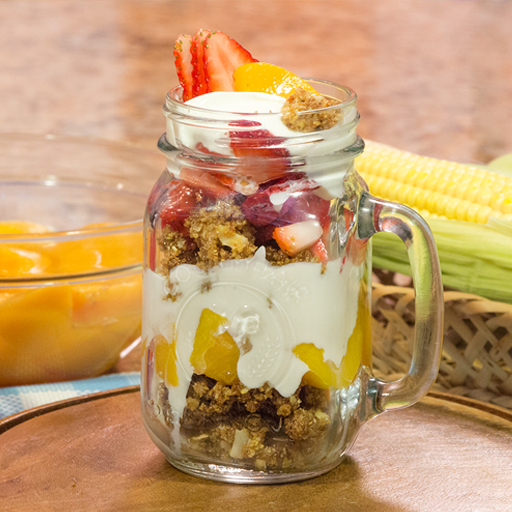 For the parfait: layer the granola, peaches, yogurt and strawberries in a jar.